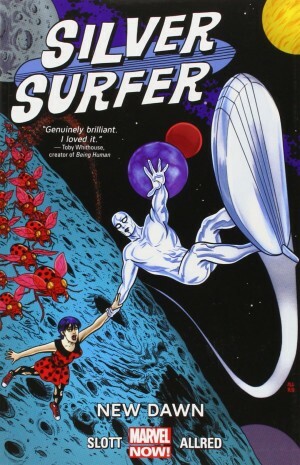 Considering the Silver Surfer can soar through space on his surfboard and the entire galaxy is his playground, he’s always lacked joie de vivre. 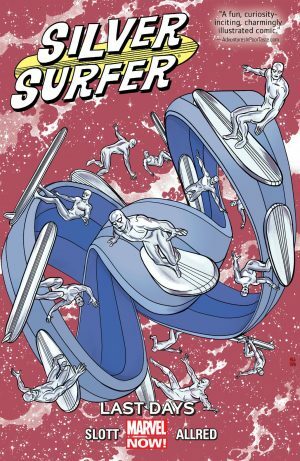 That’s a mood Dan Slott and Michael Allred have supplied in spades, and it’s reinforced over the first few pages of A Power Greater Than Cosmic, as he and Dawn Greenwood visit a series of oddly juvenile worlds that could have originated in an Enid Blyton wish fulfilment story. 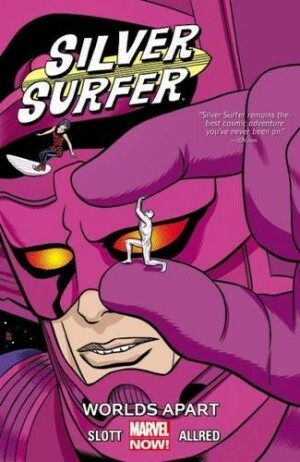 Rather sweetly, following on from what happened in Citizen of Earth, the Surfer wants to ensure Dawn comes to no harm. That’s just the start of a fantastic opening chapter spent in a very unusual casino where Dawn and the Surfer may just lose everything. What if you could no longer pronounce the letter ‘b’? There’s so much imagination on the part of both creators, and it’s all good natured, which makes this such a joy to read. There are echoes of DC’s 1950s science fiction strips drawn by the likes of Murphy Anderson and Carmine Infantino, where the future was almost always bright and optimistic, and technology was never to be feared. Part of that look is supplied by Allred’s busy drawing and the remainder by Laura Allred’s bright colours. In these days of graded computer colouring there’s often a fear of the light, and perhaps comics as a whole would benefit by some colourists putting away their digital toys and considering again what can be achieved with flat colour. 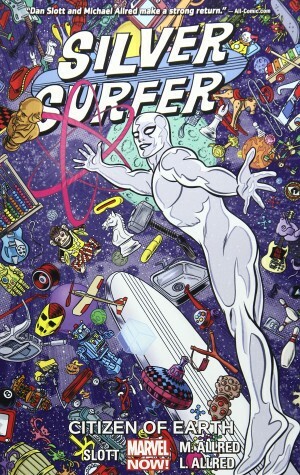 Among the brilliant ideas we have Galactus as the Bringer of Life, a fantastic race against time, a holographic society, the Silver Surfer swallowed by a giant space whale, some inventive toying with the physical manifestation of Eternity, and an eternity of a life. In between all the adventure there’s a tragedy, and in keeping with everything else, that’s extremely well presented. It makes good use of a planet seen earlier in the series, has a big imaginative idea attached to it, and some wisdom as well: “A bunch of fools the lot of you. As if a heart can mend to schedule”. Even better is how Slott ties together some of the worlds visited here and in previous books, now seen to have a purpose beyond thrilling the first time round. As this is a finale for Slott and Allred, there are some loose ends to be tidied up. Who’s that mysterious person we’ve been seeing dropping portentous hints? What about Dawn becoming an Aunt? There are answers to everything, leading to a wonderful ending. If there’s not at least a lump in your throat as you reach it you don’t deserve Slott and Allred, and should possibly seek therapy. A Power Greater Than Cosmic is the perfect ending to what’s been a high quality series, and it’s fitting that the last collection is the best. It’s a gem. 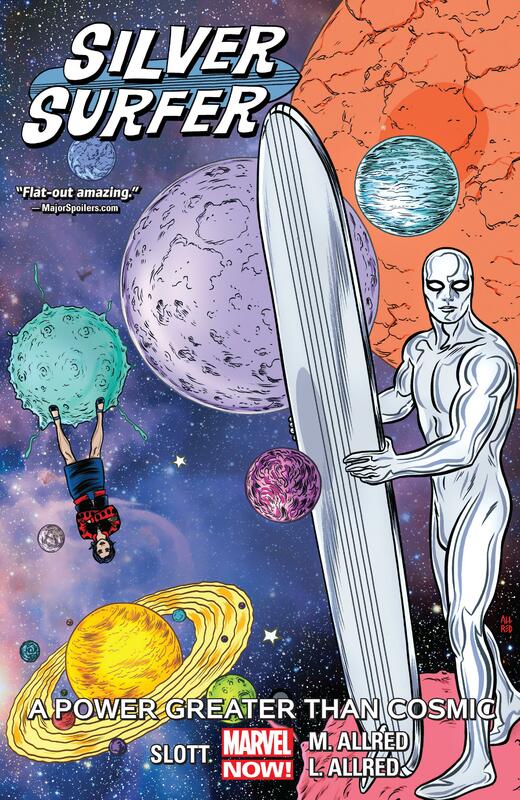 You’re a fool to yourself if you don’t give Slott and Allred’s Silver Surfer a try, and in time for Christmas 2018 Marvel are releasing an Omnibus edition of their entire run.